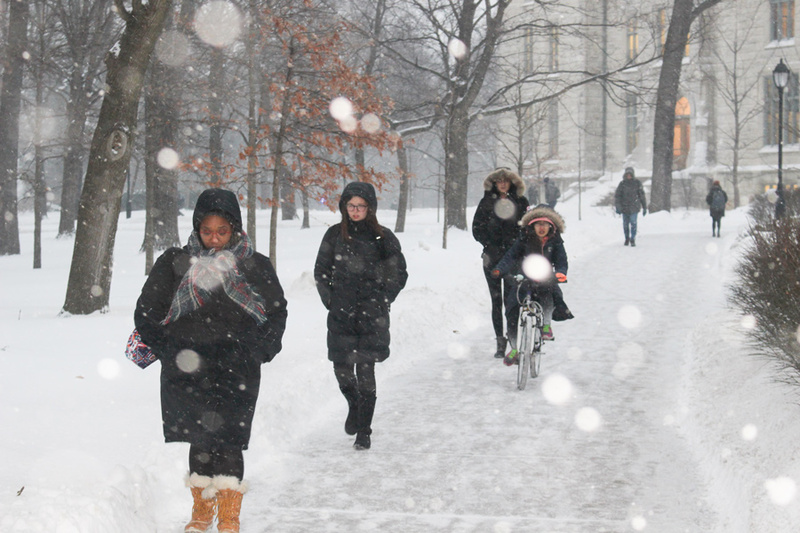 Despite Student Enrichment Services’ efforts to provide low-income students with winter jackets, some students said these coats are not enough to withstand Evanston’s bitingly cold winters. Wind chills reached between 50 to 55 degrees below zero Jan. 30, prompting NU to close for the seventh time due to winter weather since 1918. While all students struggle to stay warm, Weinberg junior Sophia Kaiser said winters are especially brutal for low-income students. Kaiser, who lives off campus, said there have been nights in the winter where she’s struggled to fall asleep because of the cold. To help out such students who struggle during the winter, Student Enrichment Services offers free winter gear — including gloves, beanies, scarves, coats and boots — based on need and availability. Yet, Weinberg first-year Kiana Staples said her winter coat from SES wasn’t warm enough to shield her from the cold once the temperature dipped to around freezing. Her coat was thin and short, she said, and difficult to layer underneath because of its tight size. “I found myself trying to have a sweater and then another jacket and then everything under my coat, which I thought defeated the purpose of having a coat,“ she said. Stables said she ended up spending $100 –– which partially came from her financial aid refund –– to purchase a new coat. SES Director Kourtney Cockrell said the coats are “brand new” and are the same Under Armour winter coats that are used for athletic teams in the NCAA. SES was able to expand its winter coat program by 40 students since last year, Cockrell said. However, she cautioned that these coats would not fully protect from an extreme weather event like the polar vortex. While Kaiser said she was also not satisfied with the quality of the coats, she appreciates the extra help from SES. Kaiser received her coat from the office during Winter Quarter of her first year. Prior to that she had to borrow a friend’s coat to stay warm. Staples said winter coats have become a symbol of the economic disparity on campus. Brands like Canada Goose — whose winter jackets can cost around $1,000 — represent privilege, especially when compared to the thin Under Armour coats from SES, she said. “I’m sure for somebody who has expensive outerwear, that they wear when it’s not even cold outside, they don’t understand what it’s like to be cold,” she said.